I was planning to add screenshot and c4d file but didn't really get this 1984ish way of doing it. Can I upload directly from my hard drive or do I first have to put it online and then add the url or what? Ok, I know, I apologize, that was a digression. I'm new to programming so please bare with me. I'm using Xpresso Python operator (node) with one Input and three Outputs. 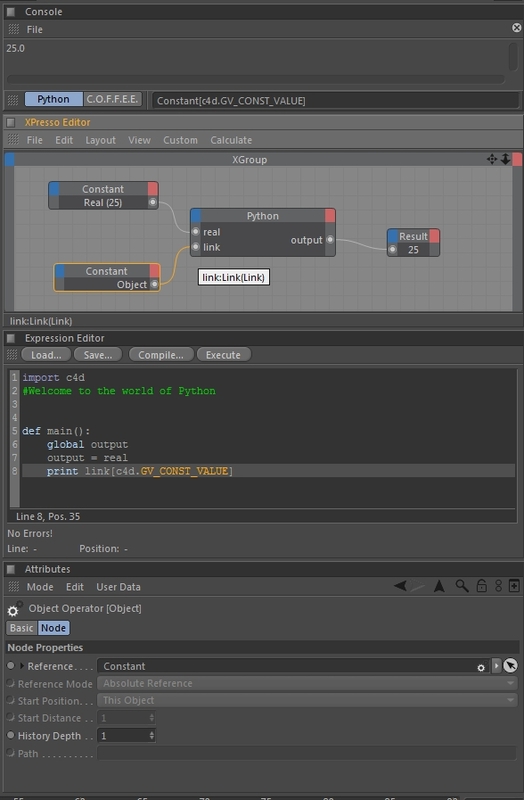 To test the input values I use a Constant xpresso node, and my main prob is getting python operator to read the inputs in the Input1 port. When I define the Input1 (example Input1=0) inside the python operator, its all good. Super grateful for all help I can get! Stay cool! Im not really shure what youre asking but your script doesnt work because your indentation is wrong. And why cant you just pipe in the value from the constant node over the input1 port instead of trying to do it programatically? i think the missing indentions are caused by the missing code tags arround his code. object with a link port. for your case the constant node. that stupid output port restriction will take effect. Thank you Bonsak. Works like a charm. I'm glad it was something simple due to my lack of programming experience. I'm gonna use it to switch between different outputs in cycle interface in userdata. I'm afraid I didn't understand what you ment by the last thing you mentioned, piping the value and so on. thanks Littledevil for discussing the original approach to my problem. You enlightened me on what the python operator node limits are. I'll play around with your solution.